I was using my cutters to get the animal shapes for today's bento. There were 3 layers for the rabbit and bears. The layers from the top to bottom : chicken smoked ham, egg sheet, and steamed rice. In the other box : mandarin orange, strawberry, cucumber, flower carrots, pea pods, and fried mackerel with tomato sauce. I stamped the cucumber with my tiny flower cutter for the 'green' baran and love the result. Cutters saved me a lot of time to prepare this bento. I will post the picture of the animal cutters that I used on my Twitter later. I love the double layer for the animal faces! It's a good set, as it cuts so clearly! Love the way you made little flower imprints on the cukes too! I get so many ideas from you Lia! Thank you! Happy Friday! m happy with the bento too - very lovely. great idea with the double layer, good effect. This looks so delicious! Never thought that rice is under those cute animal faces ^-^ And your baran is so also cute, those flower imprint is a really great idea! The cucumbers look fantastic..what an awesome idea! Woowww mbak lia, everyday is always freshly n inspiring when i saw ur post. Including for this one. @The Bargowo : Thanks a lot Menoq! Dulu Tata pernah punya problem yg sama dengan comment box. Mungkin bisa tanya ke dia kayaknya ada script yg error deh! The animal faces are so cute. I have these cutters too and only used once. The picture is at the header (salad). I love the whole picture..very sweet looking. Aw, so cute!I'd like you and your animal friends to come visit! LOL Great idea with the layers. Delightful, happy bento! Hey, after the cute animal friends have visited gnoegnoe's blog, can they come to mine? Have a great weekend, Lia! The detail of the little stars on the cucumber peel is so cute! The colors are very vibrant. I love how you use cutters, and it always highlight your bento. Your fried mackerel looks really yummy!! @bentobird : hahaha ... of course Jenn! For you, no problem. Hoping right now and animal friends will be happy :D Thanks a lot Jenn! Love the bears and rabbit. Very cute. Cute characters. 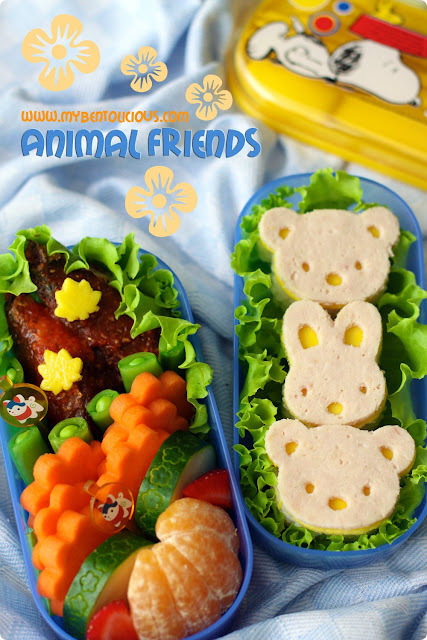 I really love how colorful your bento is! The details in the bento are exquisite! Both cute and beautiful. Lia this bento box is adorable, as always! I love the flower carrots! Mbak Lia, saya ganti link ya. Yang lama, dah nyerah ngutak ngatiknya. @Melanie : Thanks a lot Melanie for nice comment!